StaVin is known the world over as producers of the finest quality barrel alternatives. Their focus on quality above all else has seen their brand grow in popularity since their inception nearly 30 years ago. Major factors fuelling their rise have been their insistence on natural seasoning for a minimum of 3 years, fire toasting by hand, polymetal packaging and TCA-free certification for all products. Additional to this is the need for winemakers to be ever more conscious of the economics of the oak component of winemaking whilst maintaining or improving wine oak quality. As an example of the economic argument, 10 kL wine treated at 100 % new barrel impact would require 33 Hogsheads, and a winemaker is looking at an initial spend of around $50,000. On top of this there is all the manual handling, sanitisation, topping, sulphuring and relocating that comes with barrel handling. Ignoring the cost of those components, this equates to $5/L in oak cost alone. If using StaVin tank fans 15 units would be required, only one vessel is used and the initial oak cost would equate to less than 10 % of the barrel price. The quality of the StaVin oak delivery is the same or better than the barrel, but the cost is significantly lower with far less handling. StaVin’s excellent oak calculator on their website is an invaluable tool for the winemaker. This argument is only validated if the oak is indeed equal to or better than the barrel oak, and this is where StaVin stands out from the crowd: StaVin represents a genuine barrel alternative, not just an oak alternative. So having decided to give StaVin a try, how does a winemaker work out whether to use French of American oak? Or determine the right toast level for a given wine? Or whether or not a StaVin Barrel Head product will improve the oak profile? Answer: the StaVin trial pack. 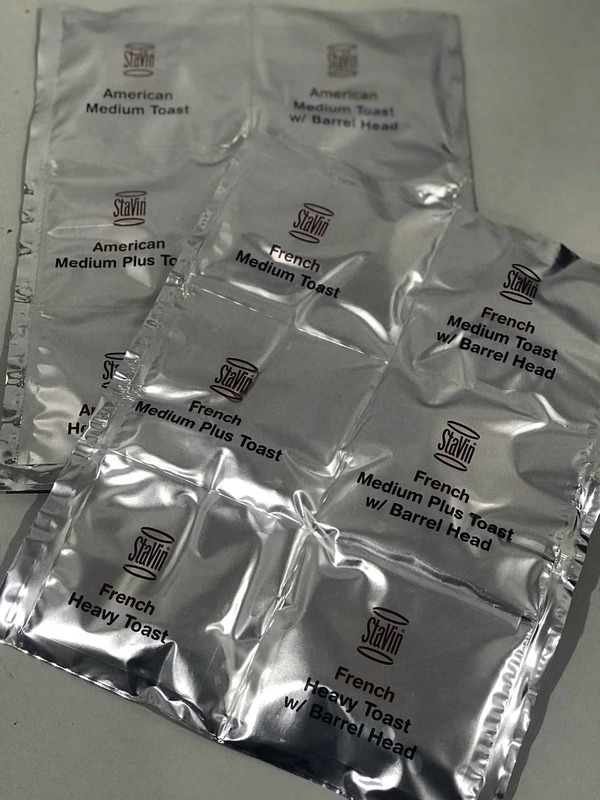 These are packaged to cover French or American medium, medium plus and heavy toasts with and without Barrel Head, so 6 variants in all plus a control wine. To use the sample pack, a winemaker sets up 7 bottles of the wine in question, keeps one as a control, adds the contents of each of the 6 sachet portions to the other bottles, peels off the labels and sticks them on the relevant bottle, and then waits for a week (no longer). The samples are then ready for tasting, and this will provide a good approximation at 50 % new oak equivalent for what can be expected in terms of the final oak profile, regardless of the StaVin product being used fan, segment or bean). These instructions are on the back of each trial pack. The winemaker can then blend the selected treated wine sample with the control to determine the % new oak equivalent required. There is a difference between the terms “barrel alternative” and “oak alternative”. If you are seeking something akin to oak characters delivered by barrel maturation, but with advantages in economics, sustainability, logistics and production efficiency, then products like Fan Packs, Segments and Beans are ideal. If you are seeking the closest barrel alternative stylistically to a traditional fire-toasted barrel, then your choice is simple. StaVin offers all of these advantages, plus the confidence in using a product that is guaranteed TCA-free. StaVin barrel alternatives give you the ability to make award-winning wines without the hassles of using barrels, in less time, with less cost and labour, and with less capital outlay. The StaVin sample packs make it easy for a winemaker to find the best oak product, new oak percentage equivalent, toast level and whether or not Barrel Head should be used. As the StaVin folks say: traditional flavour, real economics. It’s that simple.